After witnessing President Barack Obama’s inaugural address, I have to wonder if anyone else within in the sea of millions that the flooded the National Mall in Washington D.C. actually listened to what he said. During his address, he stressed selflessness and sacrifice, a return to common-sense values and a dedicated work ethic so that we as human beings, not just Americans, can halt the damages being done to our world. I was moved, touched by the voice of one of the most inspirational leaders of the twenty-first century, but I was disheartened and dismayed, absolutely appalled, when the crowd began to thin. I was upset because Obama’s address had seemed to fall upon deaf ears, I was upset because the historic, record-breaking crowd of supporters left a record-breaking pile of garbage in their wake, and none of them seemed to care. One-hundred-thirty tons of garbage, to be precise. 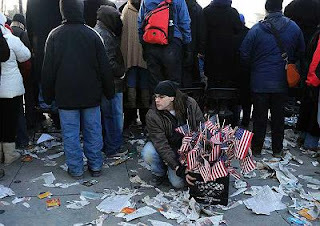 130 tons of half-eaten hot-dogs, gloves, blankets, over-priced hand-warmers, disposable coffee-cups, miscellaneous Obama memorabilia and small American flags blanketed the grounds of the National Mall. One always expects trash during a party, and with 1.8 million people in attendance, this was without a doubt the largest crowd present for an inaugural address, but the plethora of trash left behind behind was absolutely absurd. Under the shadow of the Washington Monument, newspapers blew with the frigid winds like tumble-weeds rolling across an Arizona desert while little reproductions of our national colors were trampled by the mass of tourists and D.C./Metro area residents alike. So, instead of incoherently screaming the man’s last name like some drunkard at a football game or buying a cheap, bootleg hat from a career crackhead, I looked at my feet and picked up the small American flag that I had been unknowingly standing on and I held it in my hands. It had been ripped in half, it was dirty; full of some mysterious muck that made me grimace in disgust, but I did not drop it. Instead, I knelt down and picked up another even filthier flag. They were grimy, sullied and soiled; their once majestic white was now an ugly brown. Splotches of black shoe-markings were scattered, in no particular order, across their stars and stripes equally. I was unsure of what to do with them. I didn’t want to carry a couple of nasty looking flags around all day, but I couldn’t just let them fall back to the ground where they would continue to be carelessly trampled upon, or worse, thrown away and forgotten about like common pieces of trash. These were flags. I looked up at the thinning crowd as I was shoved, prodded, and penetrated, and noticed that these small flags lay all about about the mall, broken, slightly shredded; already forgotten. 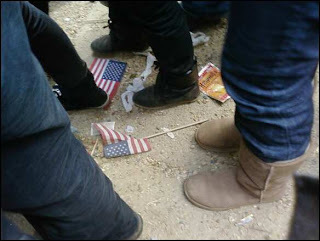 They had been a symbol of pride and unity for about an hour, only to be be discarded like common pieces of refuse once Obama had finished his Inaugural Address and retreated to the relative safety and warmth of his new Presidential limousine. No one seemed to notice that the Capital now looked like a landfill for our symbol of patriotism, and the cruel ironies only multiplied as the veritable army of media-professionals began to pluck mindless “HOPE”-filled bystanders from the crowd, scrapping the bottom of the quotable barrel to fill a three column spread or a ninety-second televised report. Just then, something came over me. Call it pride, nationalism, supernatural possession, whatever your word ‘de jour, but I had an armful of ugly little flags before I’d even noticed Aretha Franklin’s skull-devouring hat. Some still had their two-cent wooden poles, a lot of them didn’t; most simply hung by a thread or two. They were all weathered and beaten; my face twisted and contorted in every imaginable position with each flag I knelt down and dug bare-handed through piles of rubbish to rescue. I suppose that they were technically trash, but this trash wasn’t just my treasure, they were our treasures. A flag is a symbol, an image of who we were, who we are, and who we hope to be. Thirteen stripes to represent the original thirteen colonies, fifty stars to show our solidarity as an ever growing union of states that, despite varying locales, still hold the same ideals to be just and true. I scoured the grounds of the mall looking for anything with red, white and blue. I dove head first into bristled bushes and over-flowing trash cans, scrapped through gutters and the sea of frantic sycophants that had swarmed the MSNBC mobile studio (which easily held the biggest trove of mangled flags and shredded newspapers). Every flattened cardboard box, every poster, every sign was overturned in my effort to collect every last flag I could find. I wasn’t even sure what to do with them all, I only knew that these flags were far from trash and no-one, under any circumstance, is to ever let a flag touch the ground. “Old Glory” was not the only set of colors that I found that day. A Bahamian flag, a Texan flag, an Iranian flag and a Brazilian flag each found their way in to my collection. I had eventually amassed so many that I began searching for large bag, which I found fairly quickly by simply bending over and reaching deep into sewer drain on Independence Ave. Pretty soon however, my “Bed, Bath and Beyond” bag of patriotism needed to be upgraded too as it became so full of holes from the small, wooden dowel rods that a few of the raggedy flags had begun to simply fall out and float away whenever a strong gust of icy wind would charge down the grounds, forcing me to shield my face and my flags. It wasn’t long until I came across a standard milk-crate, so I carefully set my bag inside and stuffed a few of the more loose flags deeper inside. I then lugged my colorful crate of tattered greatness around in my mission to find any and all flags until I could no longer walk. I fell to my knees and hung my head low, my long hair hiding the over-whelming disparity and filth that were now etched upon my chapped, weather-beaten face. Over the course of my voluntary quest, I was mocked by soldiers, aristocrats, children, and tourists alike. However, it was these same types of people that would later come up to me during my darkest and filthiest hour (dusk) to personally thank and encourage me to continue on. A few shook my hand, others would ask for a flag, so I would happily look for the cleanest in my collection, a task which more often than not, took several minutes of digging and poking. My numbed, cracked and dry hands were left with an ample amount of splinters that I’ll be picking at for the next several days, but it seemed worth it to when Private First-Class grabbed me by the shoulder, and said, “Thank You” as he plucked a blackened and weathered flag with pride. I was photographed several times by tourists, a photojournalist, and a woman who called me, “inspirational”. I was told them all that I was just, “doing a dirty job”. At the end of the day though, I still felt just as beaten and tattered as the flags that I cradled. I had collected hundreds of flags, but I still did not know what to do with them, so I resolved return them to the American Legion trailer that sat on the north-eastern side of the Mall, opposite the Smithsonian, as they were responsible for their original distribution. 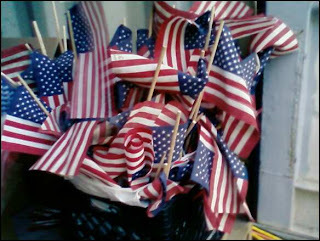 As I carefully set down my crate of withered flags, I found an aide and asked what would happen with all the flags that didn’t get passed out, as well as those that I’d rescued. “Oh, we’re probably just going to burn them later,” the aide replied casually as she shoved the remnants a hot-dog in her mouth, tossing its checkered, red and white wrapper to the ground. The picture above was taken by Jonathan Miano, a photojournalist living in Chicago and originally appeared Jan. 20th, 2009 in the Naperville-Sun Times. My crate of flags resting in the American Legion storage container at the end of the day. January 25, 2009 February 24, 2009 Dominic GwinnAdventures, Inauguration, Obama, Washington D.C.